PandaTip: Using the text field below in the source code license agreement template you can document any and all software that will be included in this source code license agreement. 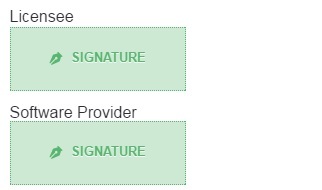 This source code license agreement is by and between [Sender.FirstName] [Sender.FirstName] (Software Provider) and [Licensee.FirstName] [Licensee.LastName] (Licensee). This agreement shall begin on [Agreement.CreatedDate]. This agreement covers the access and use of the source code for the following software, hereafter known as the “Software”. Both the Licensee and Software provider agree to adhere to the following terms and conditions. The Software Provider has granted, with acceptance of this source code license agreement, [License.Total] total licenses to be used as permitted. These licenses shall be considered perpetual and non-transferrable. The licenses granted may be used by the Licensee as well as any employees and subcontractors providing services for the Licensee. Throughout this agreement, “Software” shall be defined as all source codes, object codes, link libraries, utility programs, project files, scripts related to the software listed above. The Software shall remain the intellectual property of the Software Provider at all times. PandaTip: This template grants the Licensee access and use of the source code for the software listed. However, the Software owner remains the holder of intellectual property rights to the software. In consideration of all terms and conditions contained within this contract the Licensee shall have the nonexclusive and nontransferable rights as stated below. The Licensee will hold the right to incorporate the dynamic and statically linked libraries that the Software Provider has developed. Furthermore, the Licensee will have the ability to make and distribute an unlimited number of copies of the libraries mentioned above. PandaTip: The following template section outlines any restrictions related to the software’s use, modification, or distribution. Unless prior written consent has been obtained from the Software Owner, the following shall not be allowed. The distribution of any source codes, header files, make files, or libraries of the software. The software should not be merged, compiled, or copied unless expressed in this agreement. Alteration or removal of any notices in or on the software or within the documentation included within the software. Any distribution of the software by the Licensee that is not conducted with approval from the Software Provider. Disclosure of any source codes pertaining to the software to any additional parties not included in this agreement. The Licensee shall not disassemble, decompile or reverse engineer any object code contained within the software. The number of licenses being used may at no point and time be more than the number of licenses purchased through this agreement. PandaTip: The warranties section of this source code agreement template makes it clear that the source code is provided “as-is”, with no guarantee as to performance, stability, or ongoing reliability. All software included in this source code license agreement as well as all documentation included with said software is provided in an “as is” condition. The Licensee shall be granted a 72 hour period after initial access is granted. During this period, the Licensee may report any errors, missing features, or other issues related to the source code. This initial inspection shall be performed with the source code in its original state. Any modification or other alteration of the source code shall constitute acceptance of the Software by the Licensee. The Software Provider agrees to correct any such errors in a timely manner, after which the Licensee shall accept the source code for use pursuant to the terms of this agreement. The Software Provider makes no guarantee as to the source code’s performance once it has been accepted by the Licensee. Under no circumstances will either party or their representatives be liable to each other for any incidental, consequential, or indirect damages including but not limited to lost or damaged data, revenue loss, economic loss, or commercial loss arising out of a breach of any terms and conditions set forth in this source code license agreement. This limitation of liability shall apply regardless of if the alleged breach is a fundamental breach or fundamental term. Both parties are in understanding that some jurisdictions do not allow the exclusion of liability for consequential damages and as so the above limitation may not apply. PandaTip: The Term & Termination section of this template governs the conditions for cancellation of this source code agreement by either party. While the term of this agreement may be perpetual, this agreement may terminate immediately in the event any breach occurs of the terms and conditions listed herein. The defaulting party will be allotted 30 days to cure the breach upon written notice or face immediate agreement termination. Under no condition should any disclosures of the licensed source code or theft of the Clients computers be grounds for termination of this agreement. In the event of termination the Licensee must destroy any and all copies of the Software as well as the included documentation. PandaTip: This template clearly states that both parties shall indemnify one another against any harm or damage. Additionally, the Software Provider shall indemnify and hold the Licensee harmless against any damages related to the source code. PandaTip: Using the text field below in the source code license agreement template you can list any copyright notices as well as when and where they should be placed within the software. The Licensee agrees to display an appropriate copyright notice in any final versions of Software containing the source code distributed to third parties. Any disputes related to this agreement shall be resolved in accordance with the laws of [Software.ProviderState] and any and all legal proceedings shall take place as such. PandaTip: This section of the source code agreement template covers copyright notice, jurisdiction for resolution of conflicts, and modification of the agreement. No terms or conditions on this agreement shall be modified or replaced without the written consent of both parties. Both parties agree that direct monetary damages may not be the sole extent of damages related to a breach of this source code license agreement. Therefore, each party agrees a breach in this agreement by the Licensee will allow the Software Provider to seek additional relief from the Licensee. PandaTip: The written notice portion of this source code license agreement provides the mailing addresses of both parties as well as what kind of notifications will be allowed under this agreement. Any and all notifications with regard to this source code license agreement shall be delivered either by email, in person or by certified mail to the address listed below. No employer/employee relationship is implied or established through this source code agreement. Both parties shall remain fully independent business entities at all times. This document shall constitute the entire binding agreement between the Parties for the source code listed. PandaTip: Once this template is completed, the Provider and Licensee will be able to sign from a computer or mobile device. PandaDoc electronic signatures are court admissible and legally binding. Both parties have been made aware of all terms and conditions listed in this Source Code License agreement. By signing below, both parties indicate their approval and acceptance of this agreement.